What does Kayakapı mean ? "Kaya" means Cave and "Kapı" means Gate in Turkish. So the exact translation of Kayakapı to English would be: "Rock Gate". Please note that this name is the historical name of the Neighborhood. Who owns Kayakapı Premium Caves - Cappadocia ? Is Kayakapı a historical site ? Is the renovation still going on? Does it affect the quality of my stay ? In what ways does Kayakapı differ from other cave hotels ? Kayakapı is not only a cave hotel. It is a cultural & historical project which aims conserving and restoring a cultural / natural valued historical neighborhood. By this restoration project we aim to bring up a historical establishment at the area with high international standards. We are glad to announce that we are supported by UNESCO and WHC (World Heritage Center) for this project. We as the Kayakapı Family are ensuring you to have both a traditional, local, comfortable and luxury stay with us. I am a Tour Operator / Travel Agent and I need know more. Who can I contact ? Kayakapı Premium Caves - Cappadocia is beautiful but a bit overpriced for my budget. What can you offer ? Which languages are spoken in Kayakapı Premium Caves - Cappadocia ? You will be greeted by multilingual (English and Turkish) speaking staff at Kayakapı Premium Caves – Cappadocia. In addition to the staff, the owners are fluent in Swedish. Can I book Sightseeing Tours at Kayakapı Premium Caves - Cappadocia ? After you have made your accommodation booking, our Guest Relations will be in touch with you for any Sightseeing Tours (small group or private) but you can still arrange them upon your arrival - at last minute. But we recommend making your arrangements before checking in. Please note that all our Sightseeing Tour Services are given by our sister company: KTS - Kayakapi Travel Services. Can I book the world famous Hot Air Balloon Tours / Rides at Kayakapı Premium Caves - Cappadocia? If, yes which company do you work with ? Yes, you can gladly book your Hot Air Balloon Tours while you are completing your Online Reservation request and also you can contact with our Guest Relations for any questions regarding the Hot Air Balloon Tours. The only balloon company we are glad to suggest for our guests is Royal Balloon – Cappadocia. Not only because it is the most reputable balloon company in Cappadocia also because we are sister companies. Due to this we offer this special experience for a very special rate for our guests at Kayakapı Premium Caves - Cappadocia. Are there other activities rather than hot air ballooning in Cappadocia ? Is it possible to rent a car in the airports? We need a car, where can we organize car rental ? Yes, it is possible to rent your car at the airports through rental offices any time however we suggest you contacting with Guest Relations to schedule your car on time. What happens if I left an item at Kayakapı Premium Caves - Cappadocia ? For lost items, please contact the hotel directly by phone (+90 384 341 8877) or by the Contact Us Form. The hotel will then advise you on how to get the item returned to you. How can I reserve a room ? You can reserve your rooms via Kayakapı Premium Caves – Cappadocia / Online Reservation page, you can mail us at contact@kayakapi.com, contact us by using our Communication Form and / or reach us by telephone at +90 384 341 8877. You have different categories for the rooms. What is the difference among them? We have 7 different categories at Kayakapı Premium Caves – Cappadocia and they are differentiated in terms of their size and properties offered. Differentiations such as Turkish Bath, Heated Indoor Swimming Pool, Sauna, Private Terrace or Courtyard and etc. Can I reserve a room or request a rate quote via email? Yes. To request a rate and/or make a reservation via e mail you can contact our Reservation Department by using the Contact Us form. Complimentary rich open-buffet breakfast from 7.00 am to 10:00am is included in the rate. Yes, the 1st child up to the age of 6 years stay for free. This offer is not valid for Prime Rooms Category. For 2nd and 3rd children (and above) please feel free to contact us for the rates or you easily check the prices of the children on our Online Reservation page. What is a "Non-Refundable" reservation? By completing a "non-refundable" reservation you get a special %12 discount on our original rates. But by this you accept the full charge of your accommodation rate. Also for this rate: modifications, amendments and cancellations are unfortunately not possible. Can I book special room preferences (such as connection rooms, baby cot etc.) online? Can I reserve more than 1 room with different categories at a time? You can book more than 1 room in different room categories by using our Online Reservation page. Will your rooms offer rollaway beds and cribs? Is there a charge? We offer rollaway beds in all room categories on surcharge except for Prime Rooms. Cribs are also available and for the 1st child up to 6 years of age it is free of charge. Credit card is not a must for making your reservation. You can also book your stay using Bank Wire Transfer. But having a credit card will speed up the reservation process. All the transactions you have made through our web-site are encrypted and secured by 128 bit GlobalSign SSL. If you wish to verify our certificate please click GlobalSign logo on the below of our Online Reservation page. You can modify or cancel your reservation due to terms and conditions accepted by the time of reservation. For non-refundable reservations: modifications, amendments and cancellations are unfortunately not possible. You may cancel your reservation 7 days prior to your arrival date. If you do not cancel by this time, you will be charged for the entire rate of your stay. Please note that for non-refundable reservations modifications, amendments and cancellations are unfortunately not possible. If I change a reservation, will I still get the same rate? If your amended reservation dates are in the same rate period there will be no change. However if the dates fall in another rate period there might be slight changes in the prices. Please note that you can not change non-refundable reservations. Will my credit card be charged if I forget to cancel my reservation and what happens if I don’t stay in the room I have reserved? Your credit card will unfortunately be charged fully if you forget to cancel your reservation. This kind of process is called No-Show. What is the Check-In and Check-Out times for Kayakapı Premium Caves - Cappadocia? But we will do our best for any requests of Early Check-In and Late Check-Out. Please let us know beforehand. How can I make a reservation for a large group (family reunion, club etc.)? You may contact with our Reservation Team via Contact Us form or you can call us on +90 384 341 88 77 for special requests. How do I plan a meeting at Kayakapı Premium Caves - Cappadocia? Please visit our Meeting page for details. You may also directly contact with our Reservation Team via Contact Us form for any meeting plans at Kayakapı Premium Caves - Cappadocia. By today we have 43 rooms, suites and mansions available for sale at Kayakapi Premium Caves - Cappadocia. Are all of your rooms Cave? Except for just only ½ of one room (121 – Saadet Erkuş Evi), all rooms and suites at Kayakapı are Cave. What kinds of amenities are featured in guest rooms? Each guest room features O’live by Kayakapı Guest Amenities and these include: Dental Kit, Shaving Kit, Cotton Buds, Bath Fiber, Nail File, Olive Oil Soap, Pumice Stone, Cotton Wool, Shower Cap, Olive Oil Body Shampoo, Olive Oil Conditioner, Olive Oil Body Lotion and Olive Oil Shampoo. In addition to the O’live by Kayakapı Guests Amenities listed above, you will find complimentary box of Special Sultan Kayakapi Turkish Delight in your room/suite. In each unique and non-smoking room/suite you will have a chance to enjoy complimentary Nespresso Coffee Machine with capsules (3 capsules / day), Pocket Teas and a Bottle of Spring Water. Rooms in Majestic Cave Suite category or higher, now also feature Bvlgari Bathroom Amenities in addition to O’live by Kayakapı Guest Amenities. Does Kayakapı Premium Caves – Cappadocia offer Wireless Internet access? Yes, our hotel offers wireless Internet access in guest rooms and public areas. However you will need a password to login. This password will be presented to you during check-in. Are pets allowed in Kayakapı Premium Caves - Cappadocia? No, unfortunately pets of any kind are not permitted. What is the Non-Smoking policy of Kayakapı Premium Caves - Cappadocia? Kayakapi Premium Caves - Cappadocia operates a Non-Smoking Policy in the closed areas. At the terraces or courtyards of course you are free to smoke. But do not forget that smoking harms your body. Yes, all rooms have private bathrooms. Most of our rooms also offer Turkish Bath. Does all Private Bathrooms have Bath Tub? Unfortunately not all of our rooms have bath tub. On our Accommodation at Kayakapi page all the bathroom details are listed for room by room. If you would like to stay in a specific room please just use room search option. I have read that you Turkish Bath (Hamam) inside some of the rooms. What is it? A Turkish Bath (Hamam) is the Turkish variant of the Roman steam bath or Russian bath. Hamam is still a major part of Turkish culture, a spa of sorts for both cleansing and relaxing. Yes, all rooms have in-room safes (laptop size). Do you have A/C (Air Conditioning) in the rooms? Nature of the caves at Kayakapı Premium Caves – Cappadocia provides an optimal degree, therefore air conditioning is not needed. The temperature of the room is felt cool in the summer months and vice versa in the winter months. But as we got some feedback from our previous guests, all of the cave rooms and suites do now have A/C. Special requests can be made during the online reservation process. In order to process the special requests, it should be written in the "Special requests & Notes" section. Special requests are not guaranteed and will be honored depending on availability at check-in, but we will do our very best to accommodate the request. If you have any other specific needs or questions regarding your request, please contact Guest Relations by using the Contact Us form. Yes, we have a gorgeous Non-Heated Swimming Pool (open and free for all guests of Kayakapi Premium Caves - Cappadocia. In addition the suites of 201, 202 and 203 have their own shared Outdoor Relax Pool plus we also have 3 x Pool & Cave Suites offering Heated Indoor Swimming Pool experience inside a Cave. Is the Outdoor Swimming Pool heated? No, unfortunately our Outdoor Swimming Pool that is open and free for all our guests is not heated. However, we can gladly recommend you staying in one of our 3 x Pool & Cave Suites offering a Heated Indoor Swimming Pool experience that is private and special. Yes we have a Spa named: Kayakapı Spa. Opening hour is 14:00 and closing time is 23:00, the entrance is free for all guests of Kayakapi Premium Caves - Cappadocia. The Spa consists of Hamam (Turkish Bath), Sauna, Fitness Center and Massage Rooms. Only Massages are due to a fee which we highly recommend. Kayakapı Premium Caves – Cappadocia operates a high-service concept, hence there is room service available for 24 hours. What is Corkage Fee and does it apply at Kayakapi Premium Caves - Cappadocia? The corkage fee is a charge levied by restaurants and hotels on guests who wish to bring their own wine. This fee is generally low (often the price of the cheapest bottle at the venue) and is effectively a compensation for the trouble in serving your own wine to you. This fee also applies at Kayakapi Premium Caves - Cappadocia and is only half the price of our cheapest bottle. To examine our Wine List as PDF please click here. Babysitting services can be provided by hotel (due to a fee). Is there a place for me to store my luggage if I arrive before my check-in time or check out early? A luggage room is available at the Reception desk. The usage of the luggage room is free of charge on the day of arrival and check-out. Property has a free parking area for the hotel guests. What business services does Kayakapı offer? Fax, e-mailing, scanning, and print out services are available at Kayakapı. What if I really enjoy some of the products provided at the hotel. How can I purchase them? Where can I find hotel’s contact information (phone number, address and e-mail)? You may find the our contact information at the bottom of our web page. If you need to contact us for for more information you can use our Contact Us form. Where are Cappadocia and Ürgup? Cappadocia is a historical region in Central Anatolia largely situated within in the Province of Nevşehir / Turkey. Ürgüp is a town and a district of Nevşehir. 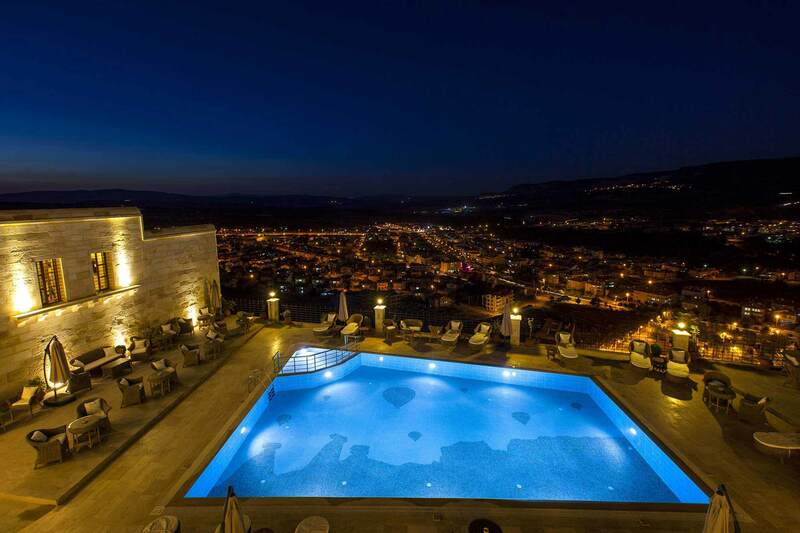 Ürgüp, by being located in the historical region of Cappadocia and near the cave churches of Göreme, it is renowned for its nightlife and for its good adjustment to tourism, making it a popular place to stay for tourist visiting Cappadocia. Ürgüp is the heart of Cappadocia as being the accommodation center and locating the official daily life of locals. You can both reach each must destination in 10-15 minutes by driving from Ürgüp and at the same time experience the daily life of the local people by walking around the historical streets of Ürgüp. I could not find you on Google Maps or GPS. What are your coordinates? Which touristic attractions are near Kayakapı Premium Caves - Cappadocia? To which airport should I book my flight? There are two airports close by to Kayakapı Premium Caves – Cappadocia: Kapadokya Airport (NAV) and Kayseri Airport (ASR). You can book your tickets through both of them depending on your time and budget flexibility. What are the driving directions from the airports? From Kayseri Airport (ASR) to Kayakapı Premium Caves - Cappadocia : Click here for directons. From Kapadokya Airport (NAV) to Kayakapı Premium Caves - Cappadocia : Click here for directons. No, unfortunately the hotel does not offer free shuttle service. But we would be happy to arrange a group shuttle or private transfer from the airport. For more information please Contact Us. How can I pass along my comments about a recent stay at Kayakapi? Where can I read comments about your hotel on the internet?